CardMonkey's Paper Jungle: Love messages -- All Month long! February is the Month of L♥VE! I hope you are having a month full of sweetness, no matter whether you have a love interest, a partner, a significant other, or not ... get in on the LOVE. May your ♥ be full! Thursday is my day to take over the Lovebug Creations Creative Team blog, and this week, we're previewing some of the new delicious colors available in Rumple Ribbons beginning February 24th in the Lovebug Creations Shop. This card features the new Icy Blue Rumple Ribbon on the lower edge of the card and tied into a bow onto a colonial white card by Close To My Heart. The sentiment, flowers and bird chipboard elements are called My Reflections Chantilly Complements by CTMH (#X7163C), and are shown in the Spring-Summer Idea Book. They have been applied using foam dots in a variety of thicknesses. The bottom edge of the card has been punched using a Martha Stewart lace punch. Now remember, if you're looking to stock up on the wonderful new colors of Rumple Ribbon, they're going to be available beginning on February 24. You'll get to see all of the new colors and sets this weekend (Feb 23 - 24) when the terrific gals of the Lovebug Creations Creative Team hop together to celebrate March Holidays, featuring all of the new colors of the Lovebug rainbow. Ellen (CardMonkey) -- You're here, silly! Now, about those prizes! YES, there are PRIZES available! ONE lucky person who comments on each LBC Creative Team's sneak peek post (this week) will win his/her choice of 2 sets of the new Rumple Ribbon colors ... and another lucky crafter will win his/her choice of two new color sets, if chosen at random from the comments made during the LBC March Holidays Blog Hop! One more thing .... If you are interested in purchasing the adorable Chantilly Complements (and/or their matching papers!) that I featured on the card I show here, I'd be happy to be your Close To My Heart consultant. You can link to my CTMH shop by going to http://cardmonkey.ctmh.com or feel free to contact me directly to place your order and ask any questions. There is a link to my CTMH shop at the upper right hand side of my blog. Thank you! ... hey, ya know? 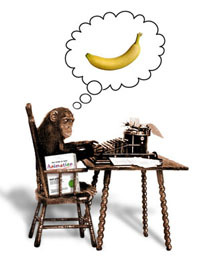 We need to keep our monkeys in bananas! GORGEOUS!! You have such an eye for color and embellies!! LOVE your card Ellen! The ribbon is beautiful & the design is breath-taking. You rocked it! Wow! I love your card! Just beautiful and the ribbon looks beautiful flat! 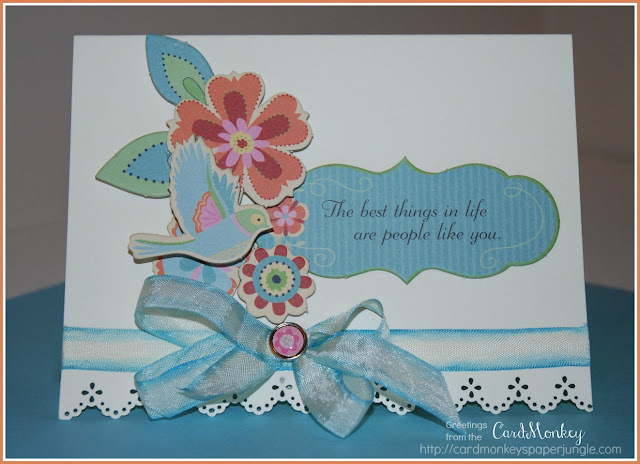 Beautiful card -Love the colors and the bottom border.... I will definitely be coming to you at some point to order some CTMH goodies!